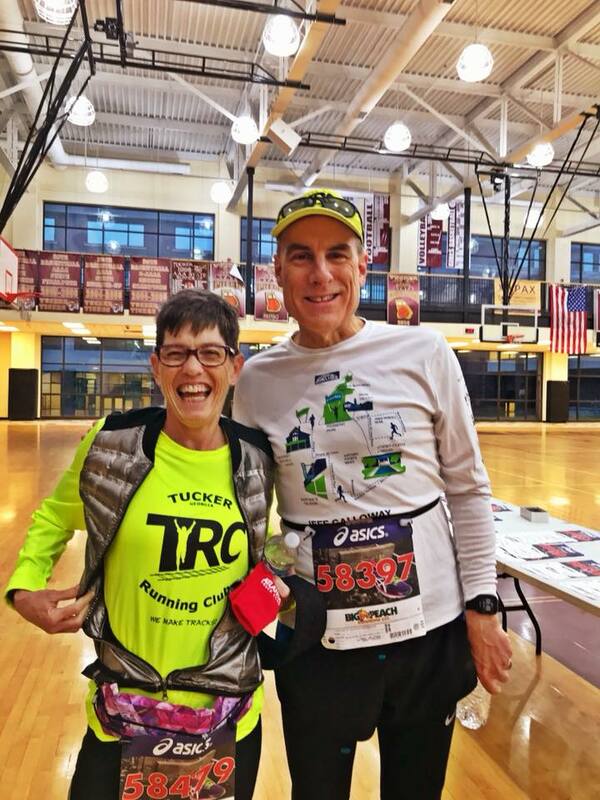 by the Tucker Tiger, while I was attaching my race bib. 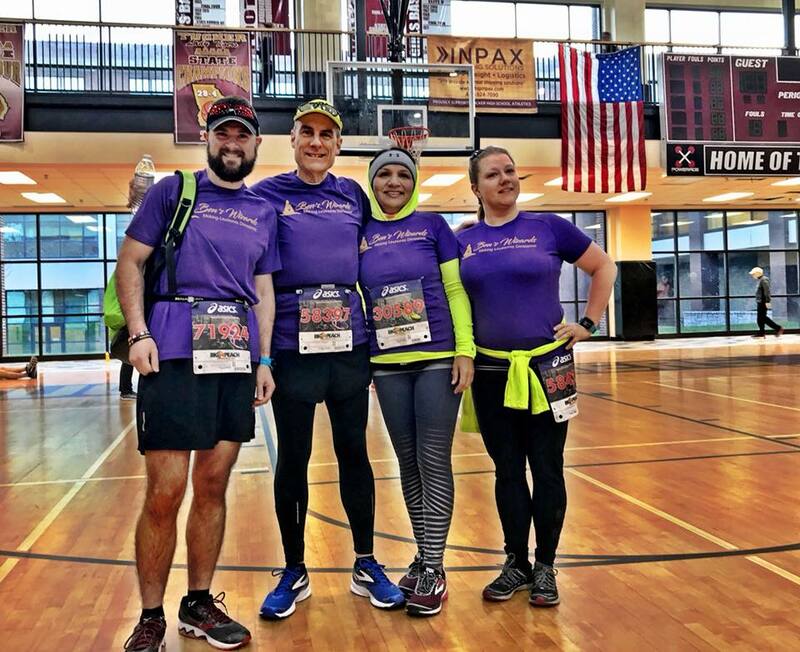 I ran the Southside 12K. 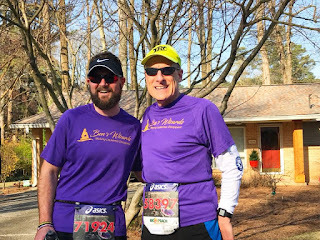 Coach Amy Begley had advised us to run the race at marathon pace, which for me would have been a 10 min / mile pace, finishing just under 75 minutes. But I had realized, if I could maintain my 10K personal record 8 min / mile pace for two more kilometers, I would finish in less than 60 minutes. And I did just that, recording a time of 59:36 for my first 12K race. 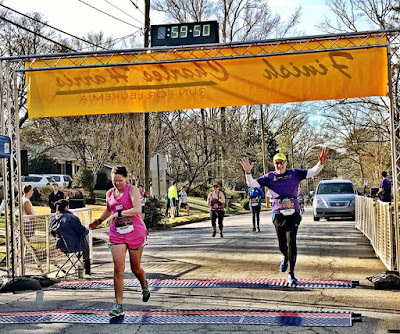 I deployed a new mantra that pushed me up the last tough hill going into the finish line. But I paid dearly for that effort. I didn't think that I was injured at first, but as the general soreness faded in the next day or two, I was left with a sore Achilles on the left ankle, weakness in the right ankle, and a painful left hip, which was either an IT band or a quadriceps strain, maybe both. I've struggled with several runs since then. Two weeks ago, I did finish a 20.5-mile run at a 12 min / mile pace to complete my third 20+ long run of the cycle. But the injuries are still bothering me, despite spending considerable time on the foam roller and less time actually running. Certainly I haven't been overdoing it during the taper period. I just hope that I can run without too much pain next weekend. Good turnout by the Tucker Running Club! For the fifth consecutive year, I registered for the Charles Harris Run for Leukemia. This is a fast net downhill course, typically held in the weeks before Peachtree Road Race registration closes. If I hadn't injured myself a few weeks ago, I probably would have raced hard today to see if I could trim a few seconds off my previous personal record of 49:28. But I was in no shape to do that today. In fact I deliberately made sure that I registered a week ago for the Peachtree Road Race, to remove one major reason to try too hard today. The main motivation for continuing with the race was to join the Ben's Wizards team. 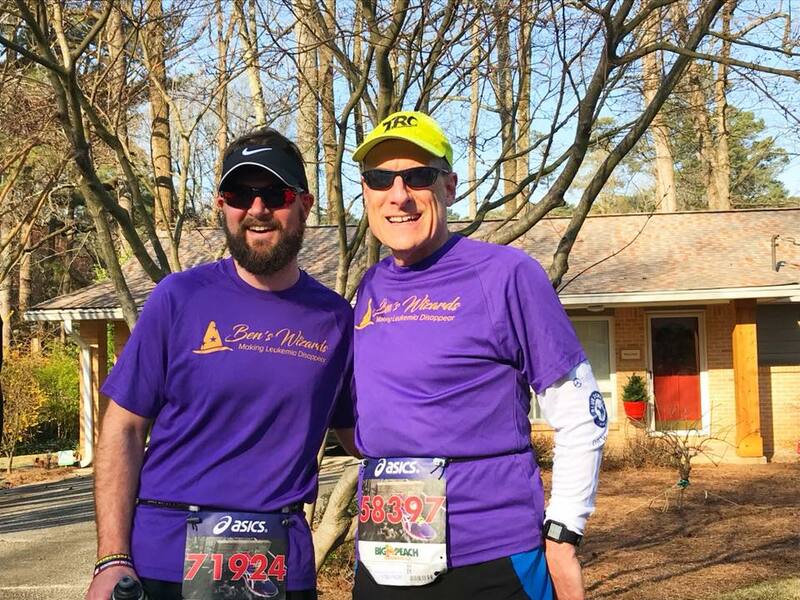 A few years ago, one of my running buddies Richard Wilson lost a friend and co-worker to leukemia. Ben Newman was only in his 40's when he passed away. Richard had told me a little about Ben in the past, and when Richard and his fiancé invited me to join Ben's Wizards, I was happy to join. They created purple shirts for the team, purple being the color adopted by the Leukemia and Lymphoma Society. 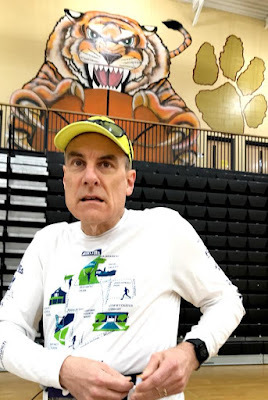 I warmed up with about a quarter mile walk inside the Tucker High School gym and then began to run slowly, feeling considerable pain in my left hip. 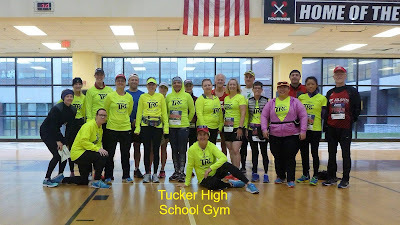 After less than a half-mile, I stopped for the Tucker Running Club photo, then resumed with two laps on the track outside, barely at a 10 min / mile pace. With some trepidation, I headed for the start, taking a position near the back of the pack. My main running goal for today was to try out a new mantra. Turns out, the mantra that I used in the Southside 12K was "too strong," pushing me so hard that I injured myself! So I needed a more appropriate mantra. 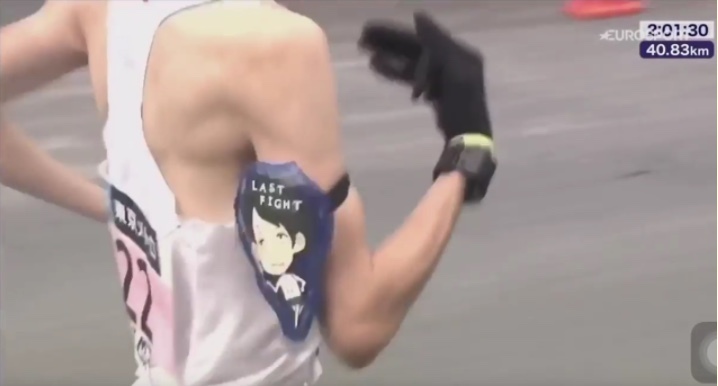 with his mantra, driving him to a second-place finish and a new marathon record for a Japanese runner. While that might have worked for Yuta Shitara in the Tokyo Marathon, in which he won a 100 million yen award for setting a new marathon record for a Japanese runner, that would be too mild for me. And then I realized that I've been carrying the perfect mantra on my wrist ID: "Quitting is not an option." That comes from our Weight Watchers leader, encouraging healthy eating in moderation, while in the midst of a largely sedentary society with abundant and inexpensive fast food options. The race started shortly before 8 am. Some of my friends in the Tucker Running Club were a little surprised to see me starting behind them, but I needed to start slowly and carefully. I had set my watch to a 4:30 run, 0:30 walk, and took the first walk break midway through the first mile. Getting back to a run was a little difficult for the first few steps, but as my legs warmed up, I was able to stride a bit better. Intending to run the race at a 10 min / mile pace, I was a little surprised to complete the first mile in 9:40. I decided that if I could stick with the 9:40 min / mile pace, I would finish in a respectable time of 60 minutes. But in mile 2, I slowed to 9:57, and needed 10:04 for mile 3. I passed the 5K marker at 31 minutes even, on pace for a 62 minute finish. It's amazing how an injury can plant so many negative thoughts in my mind. I started to wonder, in next week's race, should I drop from the marathon to the half-marathon? or the 5K? That would really be a shame after all of the effort that I've made to prepare for 26.2 miles. "Quitting is not an option!" And that's when I decided that I would try to push myself a little harder. For mile 4, I was back to a 9:43 pace. I also realized that the transition from walking to running was part of my problem, so decided to skip some of the walk breaks for the rest of the race. I certainly wasn't winded, as my voice was strong as I thanked the volunteers at the water station. I was beginning to pass other runners, and hadn't been passed by anyone since I had stopped taking walk breaks. My attitude began to improve as I just focused on running. "Quitting is not an option!" Finishing mile 5 in 9:21, and less than 49 minutes elapsed, I realized that I could run the last 1.22 miles in 11 minutes if I managed a 9 min / mile pace for the rest of the race. The great thing about the Charles Harris Run is that the mile 5 marker is at the top of a hill, with a 100-foot drop over the next half-mile or so. I started to accelerate, passing more runners heading downhill. The pain was still there but wasn't any worse, so I just focused on setting a faster pace, enjoying the easiest part of the course. At the bottom of the hill, we turned onto North Druid Hills Road, with a slight uphill. "QUITTING IS NOT AN OPTION!" Since I wasn't winded, I ran strongly uphill, passing more and more and more people as I drew closer to the finish line. 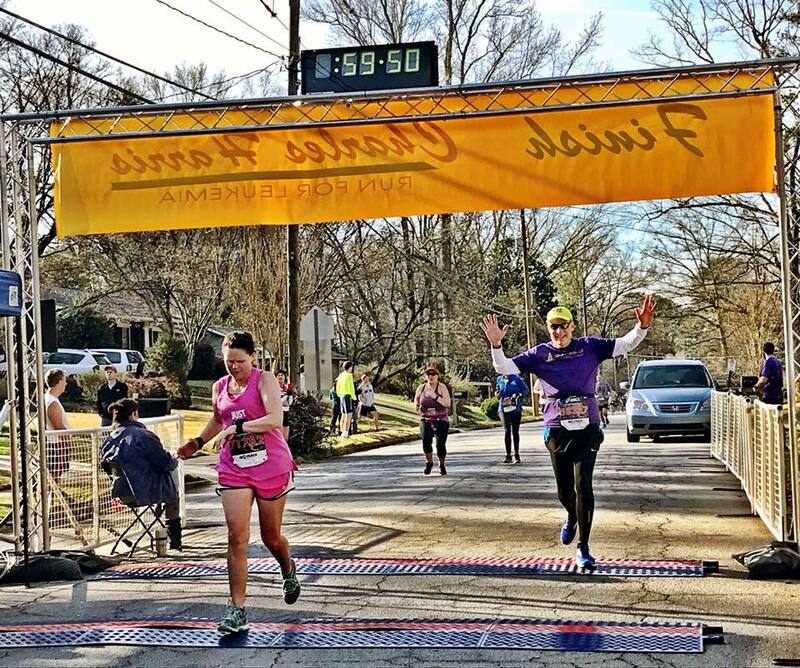 As I reached the 6 mile marker (8:42 for mile 6, 57:30 elapsed, I could see the top of the finish line banner in the distance, and I realized that I would definitely complete the race in less than an hour. I passed a few more runners, which encouraged them to run faster trying to stay ahead of me. I wasn't really racing them, I just wanted a good finish for myself. As I drew near the finish line, I could see Bonnie ahead, ready to capture my photo. At the start of the race, I hadn't expected to celebrate at the end, but as I crossed the timing mat, I flashed a big smile and raised both hands, pleased that I had run better than I had expected. 59:50 gun time thanks to a strong finish! I forgot to stop my watch until I had pulled off to the side to chat with Richard and Bonnie, but I estimate that my official time was between 59:30 and 59:40. Although my legs were sore, I didn't feel any worse for the effort. In fact the race has improved my confidence that I may continue to recover in the week remaining before the marathon. paying our respects to Ben's memory. 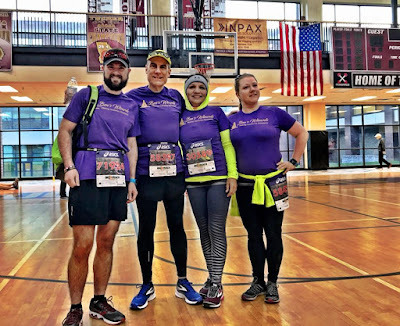 Ben's Wizards will run the Winship Cancer Institute 5K in the fall.